This is the heart of our most popular coffee beverages. 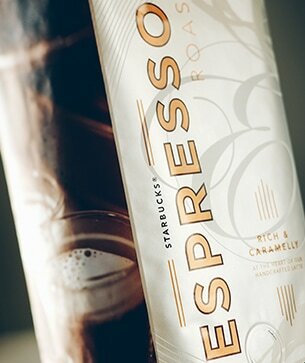 It's a special blend of beans from Latin America and Asia/Pacific darkly roasted to produce a rich and caramelly sweetness. Because this dense, full-bodied brew has a stout taste that stands up against milk, it’s the perfect foundation for making a latte or cappuccino at home. Here’s an interesting fact: Espresso was invented in Italy by an enterprising soul who was seeking a way to prepare coffee in less time, in order to serve commuters rushing to catch trains. Which is somewhat ironic when you think about it, because coffee lovers in Italy (and all over the world) now prefer to savor their espresso in long, slow sips. A croissant and a brisk walk to work.